� Entering the 2019 AVP season, Lucena owns the second-longest active streak of reaching the semifinals, having done so at least once each year since 2007. � From 2007-2015, Lucena advanced to AVP semifinals with eight different partners and reached the title match with six of them. � In the first AVP event after Lucena and Phil Dalhausser ended their partnership, the 2006 season opener, Lucena eliminated Dalhausser, giving him a ninth-place finish, his worst ever domestic finish with Todd Rogers. � Lucena won his first title with Dalhausser in 2005, then had nine second-place finishes before earning his second victory in Virginia Beach in 2010 with Matt Fuerbringer. � Lucena and Fuerbringer played in the gold medal match in Klagenfurt in August 2010 against fellow Americans Dalhausser and Todd Rogers, marking the first all-USA finals match since 2000. � In four of their first six FIVB events together (in 2010), Lucena and Fuerbringer had to play in the qualifier, but in the 2010 season finale the duo was the top-seeded team. � Lucena and Fuerbringer won a silver medal in Quebec in 2011, helping the USA to its first ever podium sweep on the FIVB Tour. � Lucena placed 17th in his first two FIVB tournaments held in the U.S., but then won medals in his next three held on American soil. 2018: Lucena and Dalhausser won four AVP events in their six tournaments together. The duo finished with a 26-4 match record, and their four AVP wins were the most on Tour since 2014. Lucena was third in digs (4.82 per set), seventh in kills (6.43 per set) and ninth in aces (.67 per set). The duo played six international events, winning one gold medal in a major event, giving Lucena at least one FIVB win for his fourth straight season. 2017: Lucena and Dalhausser won three AVP titles in five events. Outside of a forfeit, the pair was 22-3 in matches. Lucena ended the year ranked fifth in digs (4.70 per set) and ninth in kills (6.77 per set). Internationally the duo won three golds and one bronze in seven FIVB tournaments, and placed fifth in the World Championships. 2016: Lucena and Dalhausser played in four AVP events, winning twice. The pair lost three matches during the season, and all three were due to injury forfeits. He finished third in kills (6.94 per set) and 10th in both digs (4.71 per set) and hitting percentage (.417). Internationally Lucena and Dalhausser won four times (tied for the most of any team) and claimed eight medals, which was the most on Tour. The duo finished fifth in the Rio de Janeiro Olympics. 2015: For the first time since 2005, Lucena reunited with Dalhausser. In their three AVP tournaments together, they lost just two matches. They finished second, then won in Manhattan Beach, then placed third. Lucena ended the year with the most kills per set on Tour (7.34) and was fifth in digs per set (4.88). On the FIVB Tour Lucena played eight times with Brunner, earning his first medal, a bronze, in St. Petersburg, Fla. Lucena and Dalhausser played five FIVB tournaments together, getting three silvers (including two in the U.S.) and one gold medal. 2014: Lucena began playing with Ryan Doherty, advancing to five AVP semifinals. The tandem's three title matches were the second most on Tour, but each one ended with a loss to Jake Gibb and Casey Patterson. Lucena ended the year third in digs (5.62 per set). On the FIVB Tour Lucena and Doherty played in the qualifier for the first five events, and advanced each time winning a silver and bronze medal. Lucena ended the year playing one tournament with Brunner, placing fifth. 2013: Lucena formed a partnership with Theo Brunner and the duo placed third in their first tournament together. In the seven AVP events, the duo had five semifinal appearances including two second-place finishes and a win in the season finale in Huntington Beach. They ended the season tied as the second-ranked team on tour. On the FIVB Tour Lucena opened the year with a pair of 17ths with Brad Keenan. Lucena and John Hyden competed in five FIVB tournaments together with a best of 17th. They placed 33rd in the World Championships in Stare Jablonki. Lucena had a season best of fifth with his first tournament alongside Ryan Doherty. Lucena played two NORCECA events with Brunner, winning in San Diego, and one with Tri Bourne. 2012: Lucena and Fuerbringer placed second in the FIVB season opener, but that would be their only medal in 11 events. In six of the 11 events the duo was eliminated by a team seeded third or higher. The duo ended the year as the seventh-ranked team in the FIVB season points, but just narrowly missed being the second American team to qualify for the London Olympics, as the bid instead went to Jake Gibb and Sean Rosenthal. Domestically they advanced to the semifinals in both AVP events. 2011: Lucena and Fuerbringer played in 14 FIVB events, winning a silver medal in Quebec after knocking off three straight teams seeded sixth or higher. The duo placed ninth in the World Championships in Rome, and ended the season with a fourth-place finish. They were the ninth-ranked team in the FIVB season points. 2010: Lucena started a new partnership with Matt Fuerbringer, and in their first tournament together they advanced to the finals in Fort Lauderdale, but the match was cancelled due to weather. The duo collected their first win together in Virginia Beach. On the FIVB Tour Lucena and Fuerbringer advanced from four qualifiers in the first six events, with a best of fifth place twice, before winning silver in the Klagenfurt Grand Slam. That event marked the first ever FIVB semifinal for Lucena. The duo ended their season with a bronze medal in The Hague. 2009: Began a partnership with Brad Keenan, advancing to the semifinals in their first outing. They finished third or higher six times, including four straight tournaments. On the FIVB Tour, they made the main draw in three of their five tournaments, including placing 17th in the World Championships in Stavanger. 2008: Lucena teamed with Scott and they began the year with an FIVB event, failing to win their country quota match. In their first domestic event together, the duo made it to the finals in Miami, where they lost to Dalhausser and Todd Rogers. In the next six events the duo advanced to one semifinal, placing third, and had one more FIVB stop with a country quota finish. 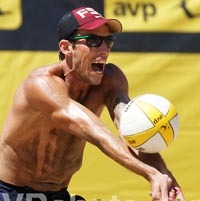 In the final 10 team AVP events, Lucena and Scott made it to nine semifinals, including five championship matches. Lucena was the third-ranked player, and the team's 11 semifinals and six finals were the second best on tour. Lucena was third in digs per game (5.49). He was named the AVP's Best Defensive Player as well as the Most Improved Player. He closed the season with a 17th on the FIVB Tour. 2007: Played the first half of the season with Will Strickland, with a best of seventh. The second half the year he reuinted with Williams, and the duo enjoyed a lot of early success. In their first tournament together since the 2006 opener, they placed fifth, followed by a third in Chicago and a fifth in Manhattan Beach. Lucena snagged his third consecutive top 20 ranking, with an 18th. Statistically he returned to the top 10 in digs per game, ranking third (5.14). On the FIVB Tour he played one event with Sean Scott at the end of the domestic season, failing to get past the country quota. 2006: Lucena partnered with four different players with a best of fifth place. In the season opener in Ft. Lauderdale, he played with Mark Williams. He then played once with Sean Rooney before teaming up with George Roumain three times, with a best of seventh. In his only tournament with Fred Souza, the pair finished fifth, then he concluded the season with Rooney, with three fifth-place finishes as their best. Lucena again finished as the 13th-ranked player on tour. 2005: Played the entire season with Dalhausser, and following a 17th-place finish in their second event, won in Austin after winning three matches in the contender's bracket and defeating each of the top three seeds in the tournament. They returned to the semifinals three times after that, including a second-place finish in Manhattan Beach. Lucena ended as the 13th-ranked player on tour, and he led the tour in kills per game (8.38) while ranking sixth in digs per game (4.75). He competed with Dalhausser internationally, finishing 25th in a pair of Grand Slams in Lucena's first two FIVB events. 2004: Started out the season with a seventh in Ft. Lauderdale with Dalhausser. In Huntington Beach they advanced to their first semifinal after knocking off top seeded Karch Kiraly and Mike Lambert, as well as both U.S. Olympic teams. In the last event of the season he had a 13th place with Chad Turner after being eliminated by Dalhausser. Lucena ranked sixth in kills per game (7.23) and eighth in digs per game (4.54). 2003: Played in his first AVP event in Ft. Lauderdale with Phil Dalhausser, but they failed to emerge from the qualifier. He played in the next qualifier with Derek Zimmerman before returning to Dalhausser for the next four events, all of which included main draw appearances with a best of 13th. 2001: Lucena made his pro beach volleyball debut on the BVA Tour in Clearwater with Jason Aucoin, who played in his only event ever, and the duo did not advance from the qualifier. � Qualified with Phil Dalhausser for the 2016 Rio de Janeiro Olympics as the third seeds. The duo went undefeated in pool play, and finished fifth after being eliminated by eventual Gold Medalists Alison Ceruti and Bruno Oscar Schmidt of Brazil in three sets. Personal: Graduated from Florida State with a sports management degree. Has three brothers and a sister, Lauren, who played soccer at Florida Atlantic. Lucena married former pro beach volleyball player Brooke Niles, and they have two boys, Gunner (April 2013) and Cole (June 2017).